Teachers and parents of students with challenging behaviors encounter obstacles when designing environments that are nurturing yet productive. This “behavior box of blog posts” highlights some tips for promoting success with our children who have emotional and behavioral needs. Behavioral meltdowns are emotionally and physically draining—not only for the child, but also for the adults, siblings, or other close children. Learn how to establish safe and appropriate escape procedures and protocol for explosive behavior. If you have ever noticed behavior that looks “lazy” or “helpless,” you might have a child who is experiencing “learned helplessness.” Learn about what it is, why it happens, and how to fix it. Get some tips for ending calling out, power struggles, and disruptive behavior. Learn ideas for getting students to self-monitor their progress and use positive language. Why Does My Student Avoid Writing, and How Can I Help? Find out why students with emotional/behavioral disorders, autism spectrum disorders, ADHD, and anxiety related disabilities tend to avoid writing—and learn ways to help them. Learn how to help students who withdraw, retreat, or show apathy toward learning. Get tips for avoiding “shut down,” and enhancing confidence. Learn how to avoid a common mistake that teachers make while a student is already shut down. 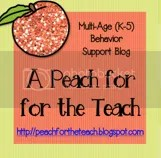 In many of these highlighted posts, I refer to How to Write a Behavior Plan. It’s a good place to go once you’ve got the basics and are ready to put a plan into action. I hope this helps you and your students find success. If you have any questions, please feel free to email me at apeachfortheteach@gmail.com. A huge thanks to HoJo for letting me post to her wonderful blog! A huge thank you to Brandi for guest blogging here today! Make sure to stop by her blog as I’ve written a post with my top 2013 blog posts! Please let us know what you thinking by leaving a comment on one of the blog posts!